When it comes to the domain name industry there is a big list of technical terms and jargon that have been constantly evolving since the early days of the Internet. I’ve composed this article as a reference for those who might not have had the opportunity to research the complete ins-and-outs of domaining. If you’re not quite sure what domaining is, I’ve got you covered below. Once you have a good understanding of the concepts listed here, you should be well on your way towards carving a path in domain name investment, research and selling domains. You’ll notice that some terms are technical and some are jargon that has now become part of mainstream usage. 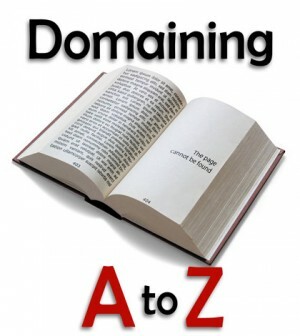 Please read through this glossary of domain industry terms from A to Z for an introduction or refresher. Alternatively, you can browse through terms you might not be so familiar with. Administrative Contact – The person designated in a domain name contact record as responsible for managing the domain name. Auctions – Domain name auctions are one of the more popular forms of domain name liquidation. A-Record – Short for address record, this can be used to point a domain or sub-domain to a static IP address or hosting account. Commonly used for third party tools. Available – You’ll hear this term referenced by domainers referring to domain names that are available to register immediately. Available domains may or may not have ever been registered before. Aftermarket – Once a domain name has been registered and is listed for sale it is considered part of the domain aftermarket. Millions of domains are currently being bought and sold in the aftermarket. Backorder – Some domain registrars offer this service. By placing a backorder you are paying for a chance to secure a domain name that is pending-deletion or about to expire. Multiple backorders for the same domain may lead to an auction on some platforms. 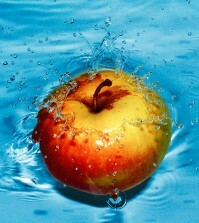 Brandable – A domain name that can be used as a brand name. Often short and pronounceable, brandable domains are one of the remaining opportunities for investment on popular TLDs. ccTLD – Short for Country Code Top-Level Domain, these special domains such as .US, .MX and .CA and are granted to each country in the World. Character – Commonly referenced when determining the character count of a domain name. A character can be either a letter, number or dash. Creation Date – The date that a domain name was first-ever registered. This data is found in all WHOIS records. Cybersquatter – Someone who uses a domain name in bad-faith with the intent to profit on someone elses trademark. DNS (Domain Name System) – The distributed naming system that maps human readable domain names to numerical IP addresses to locate website hosting services. Direct Traffic – Visits to a domain name that come organically from users typing the domain into their browser address bar. Generic domains are well known to have great direct traffic. Domain Name – A unique string that identifies ownership and enables a connection to the Internet. Domain Server – Represent part of the DNS database. Domains have at least one primary DNS server that publishes information about that domain and the name servers of any domains subordinate to it. Domaining – The business of buying, selling and monetizing domain names. Domainer – A person who actively and knowledgeably invests in domain names in some form. There are varying levels of domainers from hobbyists to multi-millionaires. “Dot” or “.” – The domain separator character made famous for it’s use in pronouncing domain names. 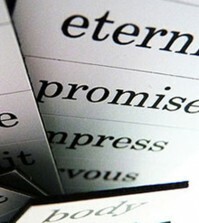 Descriptive Name – A domain name that contains keywords that precisely describe a specific person, place or thing. Dropping – When a domain is nearing the end of the expiration-cycle and in pending-delete status it is considered to be dropping or deleted from the SRS or Shared Registry System. Once deleted, it is available to register again. Deletion – As described in the above term, deletion implies that a domain name has expired and gone through expiration life cycle they are then deleted from the registry. Expiration Date – The date when a domain name is scheduled to expire. Registrars will typically turn off services at this time and offer a 30-day grace period to renew before a domain is deleted. Expired Domains – Often referenced when referring to one or more domain names that have recently expired and are available to register. EPP Authorization Key – Extensible Provisioning Protocol is an added layer of security to protect domain name transfers from one registrar to another. FTP (File Transfer Protocol) – The standard protocol for transferring files from one server (a computer) to another (a web host). gTLDs (Generic Top-Level Domains) – New domain extensions such as .Help, .CEO, .Radio that are currently being released as approved by ICANN. In 2014 we will see the launch of many new gTLDs. Geo Domains – Domain names that are targeted to a specific geographic location. Geo domains often contain a city, state or country name. These domains are highly sought after for their use in local marketing. Hack or Domain Hack – When a registrant combines their choice of second-level domain to align with the top level domain to make a word. Hijacking – When a domain name is stolen through means of changing registrant information or exploiting a forgotten expiration. 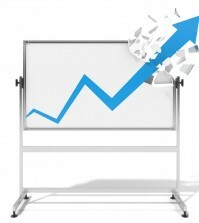 Hits – A term used to describe the number of impressions or visits an individual webpage receives. Host – The entity or company that provides dedicated servers to map domains to a web hosting environment. HTTP (Hyper-text Transfer Protocol) – The familiar string found at the beginning of URLs is the common protocol for distributed information and media across the web. HTTPS – An added security layer to HTTP in which secret keys (see SSL) are exchanged to encrypt data shared between a client and server. ICANN (Internet Corporation for Assigned Names and Numbers) – A nonprofit private organization established to oversee the top-level domain space and root zone files among other important structural Internet functions such as the gTLD space. IDN (Internationalized Domain Name) – Any domain name using non-english language specific script or alphabet. These are stored as ASCII strings and transcribed for users using Punycode. Keyword Domains – This category of domain names encompasses all those names that contain an exact match or exact phrase keyword string. They are valued for their SEO benefits. Letters – Often used when describing the amount of non-numerical letter characters within a domain. Particularly useful when marketing short domains for sale. Masked Forwarding – A service offered by registrars in which one domain is forwarded to another while keeping the original name in the address bar using hidden frames. Monetization – Earning money from domain names through means of development, leasing, advertising, PPC parking or other means. Example Name server request. See name server and resolution. Name server – A computer server which hosts a network service or program that responds to query requests for domain names and maps them to IP addresses. Namespace – The entire potential pool of domain names under a specific TLD. NIC (Network Information Center) – Entities setup to operate one or more TLDs and provide public information on domain names and WHOIS lookups. Numeric Domains – Fairly self explanatory, this term is used to describe domains comprised of all numbers. Parking – This is the process of monetizing type-in or direct traffic from unused domain names by displaying ads or other offers. PPC (Pay-per-click) – Most often associated with search engines, domain investors use PPC networks to monetize parked domains and receive a small commission per text-link clicked. Push – A term used to describe the process of transferring one domain name to another user under the same registrar. Typically free and much simpler than transferring to another registrar. Private Registration – A premium service offered by domain registrars to mask the contact information of a domain owner by using an intermediary company stand-in. 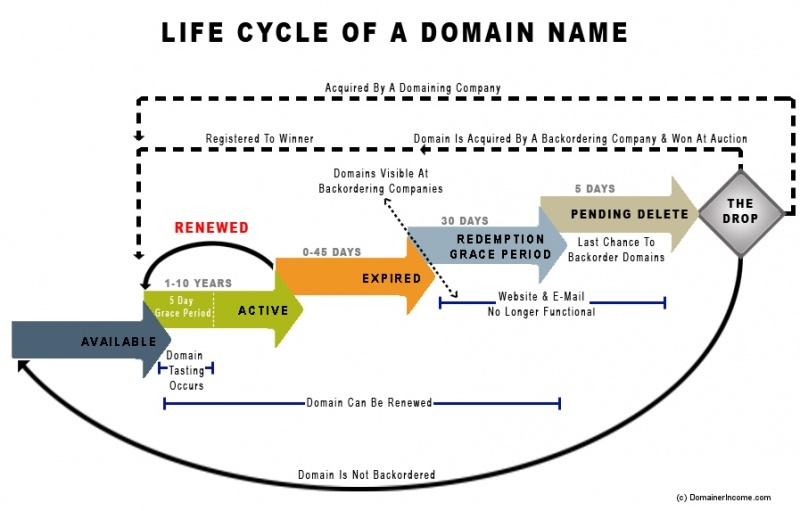 Redemption Period – The 30-day grace period offered by domain registrars after a domain expiration date where renewal may still be possible. Registrar – An ICANN accredited registrar offers the chance to register and manage domain purchases for varying TLDs. Registry Lock – A security layer initiated by registrars to protect a domain name from unauthorized transfers or contact changes. Resolution or Resolve – The process by which a DNS information is updated throughout client side of the wider Internet. Delays can occur when resolving updates to nameservers or newly registered domains. Reverse Domain Hijacking – When a company, individual or trademark holder attempts to take possession of a domain name by making claims of cybersquatting. A domain registration date and usage before a trademark claim often protects domain owners. Second-level Domain – Technically this is the part of a website address to the left of the dot or top-level domain that is chosen during registration. SEO (Search Engine Optimization) – The process of optimizing your website for the best possible chance at ranking highly for desired keywords. SEO involves a number different on-page and off-page disciplines. SSL (Secure Socket Layer) – An encryption protocol used to provide security between client and server to handle sensitive data. See HTTPS. TLD (Top-Level Domain) – The part of a website address to the right of the dot. 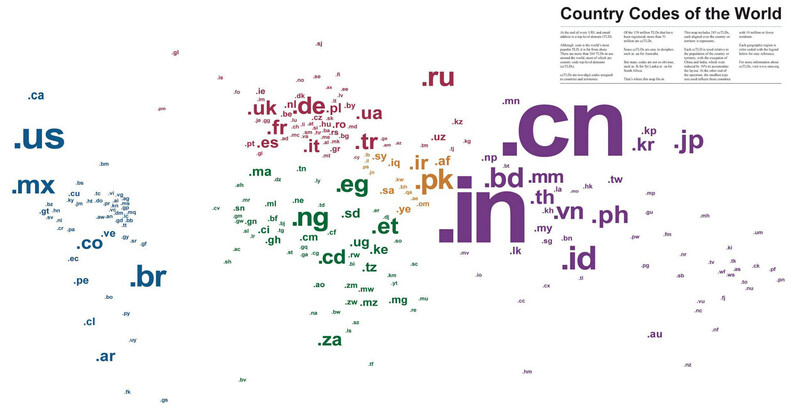 Com, net, and org are top-level domains. Trademark Domains – This type of domain is to be avoided for risk of trademark infringement. Transfer – The process by which domain name ownership is transferred or a domain is moved to another registrar. Traffic – The total amount of visitors a website or domain name receives. Often a key measurement for valuation. URL (Uniform Resource Locator) – This is the official term for the whole web address or an address to an individual resource (image, file, script). 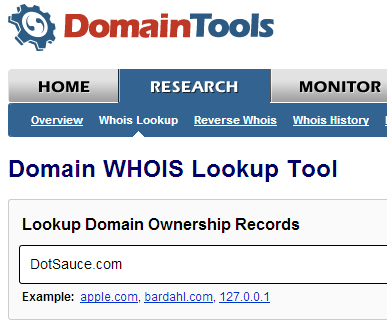 WHOIS – A protocol used to query a database for information on the registered owners of a domain name or IP address. Zone – All of the presently registered domains from a specific TLD. See namespace. Zone File – Generated by the registry, this database contains addresses of the nameservers for each domain. Thanks for reading my domaining cheat sheet. If you have any suggestions for important terms that I may have missed, please leave a comment below. Don’t forget to share the knowledge! The more people that understand the domain industry, the better off investors will be. Send this cheat sheet out to your following.